Now in its 20th year, Maria hosts the first and ONLY nationally syndicated radio show for moms. 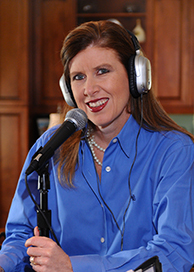 Mom Talk Radio is produced by Radio America and airs in over 50 large and midsize markets across the United States. It is also the most downloaded parenting podcast on iTunes. Mom Talk Radio has been recognized in Oprah “O” Magazine, Women’s Day, USA Today and Parenting magazine. It was also named “Best Mom Radio” by American Baby and Parents magazines. Each week Maria tackles issues important to moms and features expert guests with real-life answers. Moms can listen to Mom Talk Radio in their cars, at the office or online at MomTalkRadio.com. They can also take it with them on their iPod by downloading it from iTunes or any of the popular podcast directories.